A well-waterproofed and insulated basement offers a plethora of benefits, including improved IAQ, occupant health and lower HVAC bills. With no filters to change and no water reservoir to empty, EZ Breathe's ventilation system operates by air exchange, exhausting stale air, along with contaminants and moisture, and circulating fresh air throughout the house. 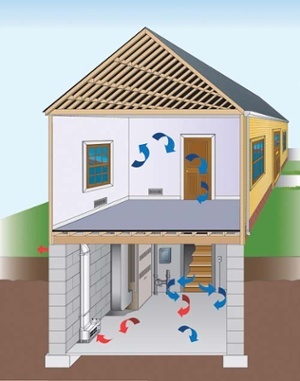 “As much as 80 percent of the cost of air conditioning is dehumidification, so buildings with uncontrolled water intrusion, whether in liquid or vapor form, place an additional load upon the HVAC system,” explains Tim Chapin, HHS, CRMI, air quality expert at EZ Breathe in Macedonia, Ohio. But perhaps more compelling is the fact that homeowners can be free of concerns about mold and mildew compromising their home’s structural integrity and occupant health. In fact, a number of studies, including one conducted by the Institute of Medicine, have directly linked exposure to damp indoor environments to upper respiratory tract symptoms, coughing, wheezing and asthma flare-ups amongst people with asthma. A good quality waterproofing system requires both a water barrier and drainage plane to direct water away from the basement’s building enclosure. For example, a highly impermeable membrane like Mar-flex Waterproofing & Building’s Mar-flex 5000, Tremco’s TUFF-N-DRI or Cosella-Dörken’s DELTA system should be applied as the first line of defense. Next, the drainage board both protects the coating and helps channel the water away from the foundation. Mar-flex offers the ShockWave board, which can also boost insulation, and the “C” Drain drainage tile, which is installed along the footer/foundation walls to send water into the sump/drainage system. “A proper drainage plane should always be on the exterior of the foundation and be the outermost layer of the foundation protection system,” explains Barrett. Along these lines, Cosella-Dörken offers a couple of solutions. One is the DELTA-MS, an air-gap membrane that offers both damp-proofing and drainage and is installed on the concrete or block foundation. The other is the DELTA-DRAIN, which is a drainage board placed on top of the waterproofing to both protect the waterproofing and act as a drainage composite providing relief from hydrostatic head—defined as pressure created by water build-up.